If you’ve ever been in physical therapy, you’ve likely used a stretchy latex tube or flat strip called a resistance band. It is incredibly effective at building strength and endurance…easing lower-back pain and arthritic discomfort…and improving balance. What you may not know: Resistance bands are a safe way to build strength on your own if you have a bad back, joint pain or other problems that can make weight-lifting off-limits. 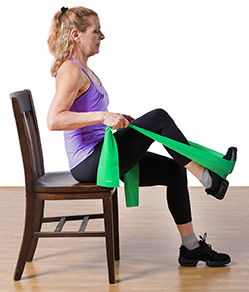 Once your health-care provider gives you the green light, first try whatever moves below are right for your condition without a band—to make sure you can do the motion without pain or discomfort before adding resistance. (If there is discomfort, check in again with your doctor for advice.) Ideally, these exercises should be done three to four times a week. • Pelvic lifts. While lying on your back, place a band across your hips and grab each end, placing your fists on the floor. Slowly lift your hips to a comfortable height (a 45-­degree angle from hips to shoulders is ideal), engaging your glutes (the muscles in your buttocks). Count to one, then return to start position. Repeat 15 times. If you have hip pain or hip arthritis: Years of overuse or being overweight can turn good hips bad. The moves below help promote the stability and mobility that healthy hips need. Note: If you’ve had a hip replacement or have severe hip issues, consult your doctor for specific exercises. • Seated leg press. This works the quadriceps (the stronger the leg muscles are, the less stress is placed on painful joints). Sit in a chair, both hands gripping either end of a band so that you can loop the band around your right foot. Keeping your left foot on the floor, lift the right leg up, gently resting the right foot in the middle of the band. Extend your right leg out in front nearly all the way, then crisscross the band once to keep your foot from slipping off. Pull elbows back to the waist. Slowly bring the right knee in toward your chest, stopping when knees reach a 90-degree angle, and press back out, without locking your knee. Switch sides. Start with just a few reps and gradually build up. • Hip extension. Attach a flat band or tubular band,* see photo, to a door using a door anchor strap (available online or in sporting-goods stores). Facing the door, attach the other end of the band to your right ankle. Move far enough away from the door to place some tension on the band. Keeping a slight bend in the left leg, slowly extend your right leg backward, engaging the glutes. You can grasp a chair for balance. Hold for one to two seconds before returning to the start position. Repeat 10 to 15 times. Switch sides. • Forward lunge. Stand with your left foot in the middle of your band and grab the ends with each hand at a location that provides adequate resistance. Typically, your elbows will be waist-high, arms bent. Slide your right foot backward, attempting to lower your right knee as low as you comfortably can—to the floor if possible. Now transfer your weight back to your left leg as you push up through your left quad and glutes until standing. You should feel an increase in resistance in your left leg as you rise up. Repeat three to five times. Switch sides. 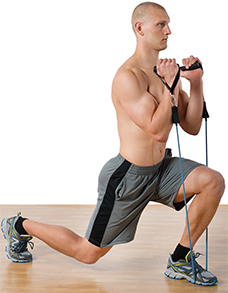 Resistance bands are available online or in sporting-goods stores for about $20 or less. They come in a rainbow of colors, each representing a different intensity. They also come in different lengths—the longer the length, the less resistance. For most beginners, I advise starting with a three-to-six-foot flat band. To increase the intensity, you can “choke up” on the band before moving up to a band with a higher level of resistance. 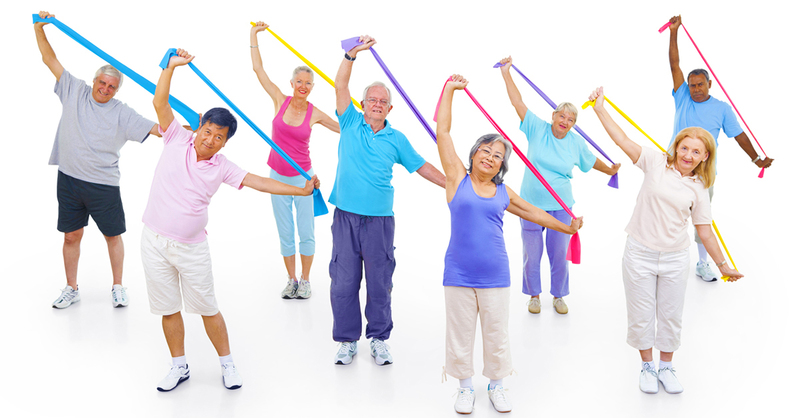 *People who have had pain or arthritis often like to use a tubular band. It is less likely to tear or snap—and comes with easy-to-grip handles.